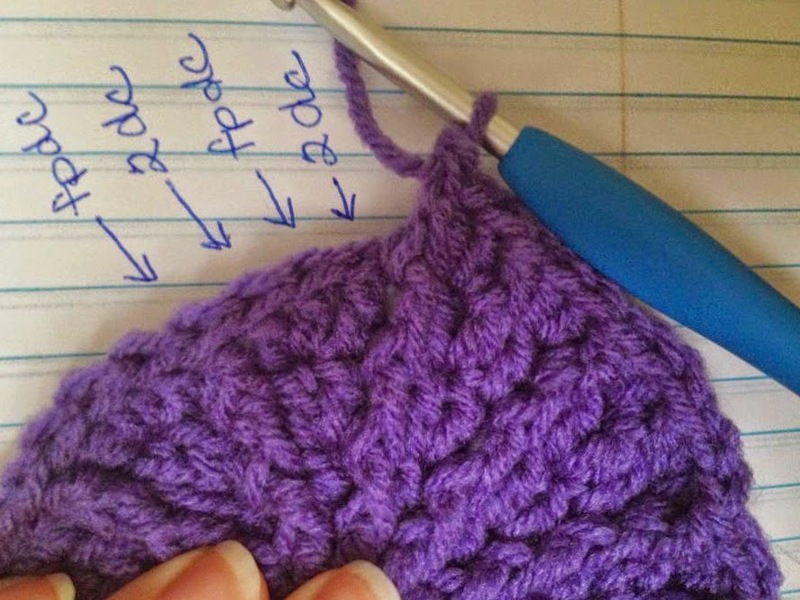 Special Stitch: Crab Stitch aka Reverse Single Crochet. 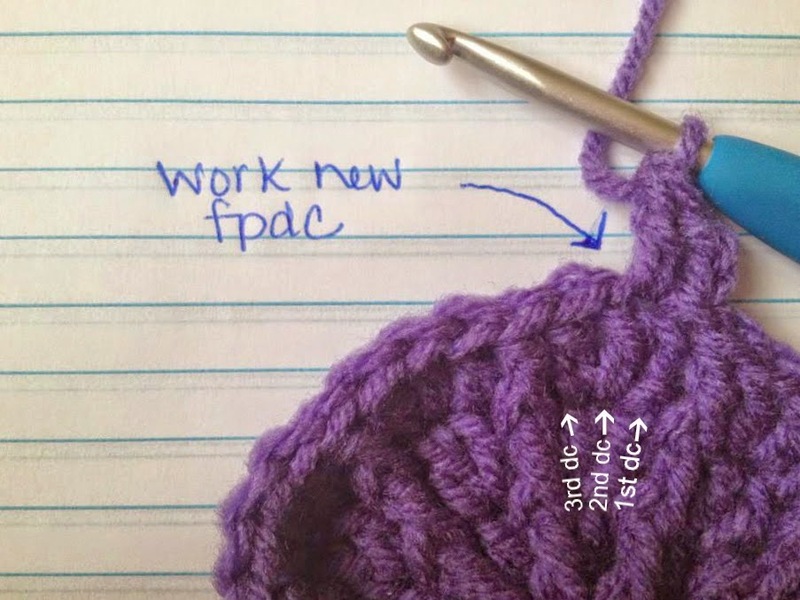 Explanation: You will be working from left to right for this stitch, it will feel awkward! Ch 1, *insert hook in next stitch to the right, yarn over and pull through (2 loops on hook), yarn over, pull through 2 loops. * Repeat from *to* around for last row of hat. -Ch 2's count as dc. -I've had a few questions about rows 4 & 5 so there is now a short photo tutorial for rows 4 & 5 following the pattern. Note: The side currently facing you is the Right side and your ribbing will be worked on the inside of the hat. Fasten off and change to desired color for the edging. With new color join in any stitch. The next row is optional, if you don't want to crab stitch around do an additional row of sc's. Row 22: Ch 1, crab stitch (I've also seen this referred to as reverse single crochet) around. Join & Fasten off. 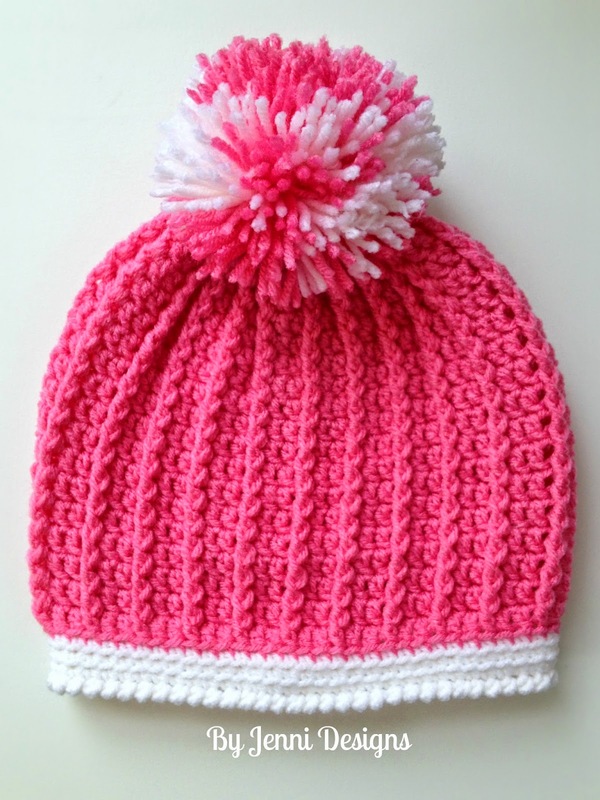 Sew in your ends and add pom pom to the top of the hat if you wish! Your hat should look like this after round 4, in round 4 you are only increasing the dc's. Round should end with 33 dc's & 11 fpdc's with 3 dc's between each fpdc. Remember beginning ch 2 counts as a dc. In round 5 you will be increasing the dc's and the fpdc's. Begin the row by Chaining 2, dc in the same. Now you will be working a brand new fpdc around the 2nd dc from the previous round. After you create the new fpdc you will work 2 dc into the next dc, then fpdc around the fpdc from previous round. At the end of this round you should have doubled your fpdc's for a total of 22 fpdc and you should now have 44 dc. Round 6-18 will simply be working dc's in all previous dc's and fpdc's around all previous fpdc's. So I am working on this and am at round 10 or 11 (haven't counted yet) and I'm having trouble with it wanting to curve the wrong direction and the darned thing doesn't seem to want to take no for an answer. (It's curling so that the FPDC are on the inside) any clue what I might be doing wrong? I've tried just ignoring it and hoping it'll fix itself. I've also tried forcing it into the proper shape and that doesn't work. I would just shrug it off and let it be but then I wouldn't get the pretty ribbing and the inside isn't exactly interesting enough to be the outside. Help! 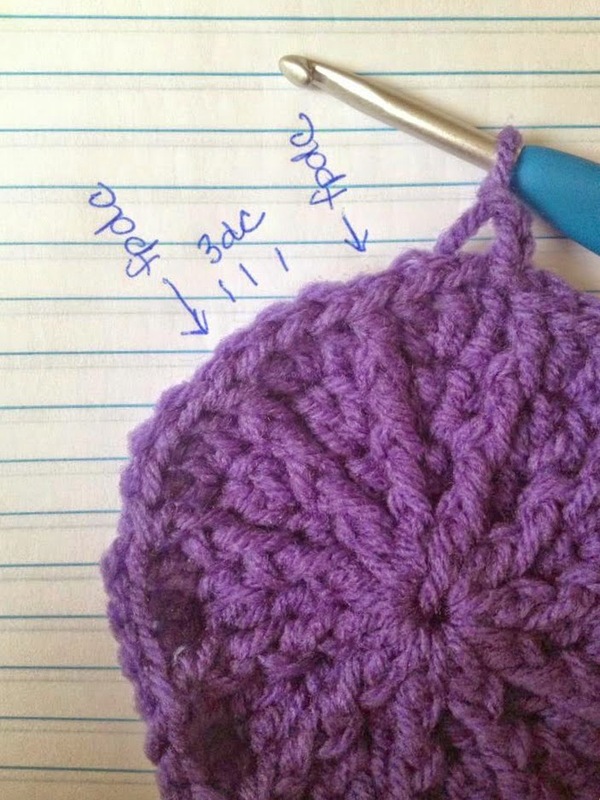 Hi crunchycrochet, while crocheting this hat the ribbing with be on the inside of the hat and at the end you should turn it right side out. I apologize, I thought I replied already! BLO stands for Back Loop Only. How do you make your pom poms? Mine look terrible. It definitely takes practice, mine didn't look so great when I first started making them. lol. Hi Teresa! I'm sorry, I haven't made it in that size so I don't have the changes. I would try and search on Ravelry.com and maybe you will find a similar hat pattern there. Thanks so much, Jenni. I'll try it! For those asking... I did this pattern using an "I" hook and this will fit a 6 year old. Probably up to 9 years. May need to adjust the length. Hi, I love this pattern but want to make it for a one year old who also isn't nearby and would like to make it as a surprise. Am I right in assuming this would be too big? Would I be able to scale the pattern down some? Thanks. Yes, this would be a tad bit too big for a one year old. Are rows 6-18 the same as row 5? Hi Oriana, rows 6-18 are not the same as row 5. Rows 6-18 have no increases, row 5 is the last row with increases. Your hat is really amazing. Can you please mention what age size is this? I would like to crochet this hat for 5years old so how many stitches I have to work? Hi & thanks Jeenu! The sie is in the title, pre-school (toddler) size. I am getting ready to publish the children's size very soon and I'll add the link here when I do! Hi Charlotte, Rows 6-18 should all end with 66 stitches total. The chain 2 counts as a dc in that stitch count but you should be joining to the first dc of each row, not the chain. I apologize for any confusion, this is an old pattern of mine and it really needs to be re-written! This hat is adorable. So, if I leave off the pom-pom and leave the last row the same color, can it be reversible? What a great idea Cathy! I just turned the hat I have here inside out to see how it would look and it has a look similar to the waffle stitch, just less raised. Do you have instructions on how to crochet this for an adult? Hi there! I love this hat and easy pattern! Thank you for sharing! If I wanted to add a brim rather than the white stitching at the bottom,do you have any suggestions on modifying? I am sorry, I do not. That's a great idea though!